I finally left sunny Bogota on Monday and made my way to Villa de Leyva, a beautiful colonial town dating from the 16th century. It really is stunning and one of the prettiest villages that I have ever been to. My accommodation was amazing, I had my OWN room (yippee!) with private bathroom, beams on the ceiling, TV...heaven, and all for the same price as my shared dorm had been in Bogota! That evening I headed out for some nice food and soaked in the fun atmosphere. It is a tiny place, very quiet and peaceful. The next morning after having a walk through the cobbled streets and some delicious fresh fruit juice I decided to continue onwards as felt a bit lonely as it was so quiet. After much confusion over what bus to get - my Spanish and no one else speaking English not always an easy combination... I found a bus heading the right direction and hopped on. Before leaving, a lovely Argentinian couple who had just come from San Gil recommended a fantastic hostel called Sam´s VIP hostel. As soon as I arrived I knew it had been the best move! The hostel is full of fun people and has a great vibe - much more me. 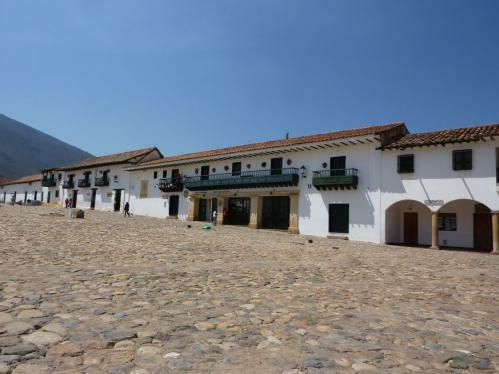 I met a really nice girl called Laura - who incidentally, despite the charm and beauty of Villa de Leyva also felt a bit isolated there too! I ordered some food and had a nice evening meeting new people and finding out the best places to visit! The next day Laura and I went to Barichara. This is another beautiful mountain village with cobbled roads and beautiful old buildings. The weather was great, blue skies and sunshine all the way with hazy mountains in the distance - the photos are so rubbish in comparison to what it really looks like. Despite the intense heat of the day, at 1.30pm Laura and I decided it would be a great idea to do the TWO hour walk to Guane instead of having lunch! In our heads, two hours didn´t sound like such a long time and we imagined a gentle flat stroll to the next village. An hour and a half later, climbing lots of (small) hills with very tired feet, we had nearly run out of water and were both really shaky from lack of food! There was very little shade for the entire walk and we wondered if we had taken the right path! Eventually though, we arrived late in the afternoon when the temperature started to cool a bit and we suddenly felt much better. It was so worth the walk as the village was lovely and we finally sat down for a well deserved juice and some food - yum! This afternoon I am going paragliding. Absolutely terrified, but hopefully it will be fun! Then I am off to the BEACH. I do feel like I could stay here in San Gil a few more days, but I feel the sea calling my name! Its a 12 hour overnight journey so hopefully no one will decide to hold up our bus...unfortunately they have no day travel options!